The manner in which time is captured forms the foundation for synthesis, design, and optimization in batch chemical plants. However, there are still serious challenges with handling time in batch plants. Most techniques tend to assume either a fixed time dimension or adopt time average models to tame the time dimension, thereby simplifying the resultant mathematical models. A direct consequence of this simplification is a suboptimal process. Synthesis, Design, and Resource Optimization in Batch Chemical Plants aims to close this scientific gap. 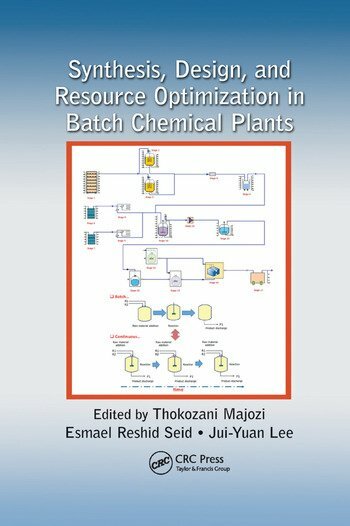 Synthesis, Design, and Resource Optimization in Batch Chemical Plants offers a comprehensive discussion of scheduling techniques, continuous-time formulations, and the synthesis and design of chemical plants that optimally utilize water and energy resources. Thokozani Majozi is a full professor in the School of Chemical and Metallurgical Engineering, University of Witwatersrand, Johannesburg, South Africa, where he also holds an NRF/DST chair in sustainable process engineering. He was previously an associate professor at the University of Pannonia, Veszprém, Hungary. Highly decorated and widely published, he holds a Ph.D from the University of Manchester Institute of Science and Technology, UK, and is a member of the Academy of Sciences and a fellow of the Academy of Engineering, both of South Africa. Esmael Reshid Seid obtained his B.Sc in chemical engineering from Bahir Dar University, Ethiopia. He worked in the process industry for three years before joining the University of Pretoria, South Africa, where he obtained his M.Sc.Eng and Ph.D in chemical engineering. Dr. Seid has had several publications on design, synthesis, scheduling, and resource conservation, with particular emphasis on water and energy for multipurpose batch plants, featured in international refereed journals. Jui-Yuan Lee is an assistant professor in the Department of Chemical Engineering and Biotechnology at the National Taipei University of Technology, Taiwan. He received his B.Sc from National Cheng Kung University, Taiwan, and his Ph.D from National Taiwan University (NTU). He spent two and a half more years at NTU doing postdoctoral research, before joining the School of Chemical and Metallurgical Engineering, University of the Witwatersrand, Johannesburg, South Africa, where he stayed eight months as a postdoctoral fellow. Widely published, Dr. Lee focuses his research on process integration for energy savings and waste reduction using mathematical programming. "… deals with a very important element—water. … covers desalination, water networks, and water conservation. … treats water as part of the operational and design optimization, which is not the case in most contributions." "… combines theoretical topics—for instance, a new technique for scheduling of multipurpose batch plants, which is at the early stages of development and is applied to small-size examples—with more applied ones, like the challenges of planning and scheduling in the biopharmaceutical industry. … draws the attention of the reader and makes him/her interested in the field of batch plants." "The topics selected by the authors are of importance for researchers and specialists who are interested in the design and synthesis of batch plants, especially on the utilization of energy and water." "The main strength of the book is the systems approach to the design and operation of batch processes, with the inclusion of the different resources that can be involved in the process in the definition of the optimization problem. … Another important topic is the design/retrofit of a sustainable process, with multi-objective optimization being used to evaluate the tradeoff between economic and environmental impact." "… highly descriptive—includes detailed methodologies and relevant case studies. The methods are presented clearly and demonstrated well by case studies. The structure of the book is well thought out and has sufficient depth and breadth to cover the topic." "… presents state-of-the art models for the scheduling, synthesis, design, and resource optimization of batch chemical processes. … an excellent reference book for those interested in the latest research developments in this area." "Great novelty of this book is that it bridges disciplines such as reaction engineering, modelling and simulation, water and energy optimization and design for providing comprehensive understanding of batch reactor systems widely used in many process industries." "… is an excellent collection of very relevant chapters, written by the experts from different parts of the globe, covering the various aspects of scheduling, design & synthesis, and resource conservation for batch chemical plants. The environmental aspects have been addressed in the form of energy and water conservation. The emphasis has been placed on the rigor and essence of scheduling framework in batch chemical plants. It has also included the most recent and state-of-the-art techniques for scheduling of multipurpose batch plants including pipeless batch plants, which are the most complex type in this category."